Two years ago we wrote an article on What to do with your used cooking oil and since we are in the high cooking (and probably frying) season, we would like to invite you to revisit that post and make sure you will be disposing of your cooking oil the best way. Also, Earth911 posted some interesting information about cooking oil that is worth reading. One bit of sad news about our article is that local recycler Elias Victor is not making biodiesel from used cooking oil any longer. We contacted him on November 27. 2013 and he said he stopped working on that simply for lack of time. He did not know of any other local recyclers and we could not find any others either. If you know of any in Brevard County, please contact us. We left a message for Green Oil Recyclers at the number listed in the county's Recyclopedia (321-403-1771). Let's hope they are still operating in the area and are an alternative for whomever would like to recycle their used oil. These services are available in different parts of the world. For example, Wastevegoil, in the UK, offers free collection of any amounts of waste vegetable oil of 20 liters or more and the recycled oil is converted into biodiesel. It would be nice to have something like that available in Brevard. 3rd Annual Recycle Brevard Festival - What a great event! Despite threatening showers, the festival came out great! It was our first year partnering with Parks & Recreation and the Reusable Resources Adventure Center and we are really pleased that this partnership proved to be a success. Everyone loved the location, kids enjoyed the activities we brought to them, and all families had a chance to learn a lot from our wonderful exhibitors. They all had a good time! All this would not have been possible without each and every person and organization who supported and assisted us along the way, so we would like to THANK YOU very much for being part of this festival. Our sponsors believed and supported us, so many thanks to them. Special thanks go to our fantastic guest speaker and exhibitor, River Grace, and his family. It was wonderful to learn more about his award-winning research project -- “Rain Dance of the Radiata” -- and meet his very own radiata tortoises. Thank you also to Taylored Photography for donating their time and talent to document the festival through beautiful pictures. Thank you to Timmy Vee, our DJ from WA1A, who played great music and helped announce and promote our activities throughout the festival. WFIT for the interview opportunity and for announcing our festival on the radio. 98.5 The Beach for including our festival in their announcements. Viera Voice who came over to document and support our event. A super thank you to Jasmine Longo who, even from a distance, was able to help promote the festival online. A very, very special thank you goes out to Terry Mott who helped organize the whole festival putting a lot of time and effort towards it, contributing with great ideas, working on getting sponsors for the festival and being a sponsor herself. And last, but not least, our deepest thanks to Marcia's family: daughter, Melissa Booth, for being her inspiration and a great helper at the festival; to her husband, Stuart Booth, for supporting her and helping her create this festival for the community. Our sincere thanks to you all and until next year! The Day to Celebrate Sustainability is Here! And the day is here! TODAY the day starts with the 3rd Annual Recycle Brevard Festival - from 10am to 2pm at POW/MIA on US1 between Grills and Pineda Cswy. Come and meet River Grace, West Shore Jr./Sr. High School student, winner of the Broadcom MASTERS national science competition this year. He will be sharing information about his research project and talking about how individuals can have a real effect on conservation and other forms of environmental protection. Participate in a TOY SWAP, or drop off gently used toys, clothes, and shoes to benefit Friends of Children of Brevard County, Inc., games, clean-up and MUCH MORE! And in the afternoon, from 3 to 7pm, to continue the celebration, go to Kiwanis Island Park in Merritt Island to participate in the EcoLiving Jubilee. Learn from sustainable living exhibitors, have fun doing eco activities, eat at one of the locally sourced food trucks, and much more! At 6pm, the movie Gimme Green will be on the screen! Enjoy your day at our local parks and join us in celebrating sustainability! Many entries for our contest in partnership with Keep Brevard Beautiful were dropped off at the Viera Discovery Center, who kindly served as the drop-off location for the contest. Four judges selected first, second and third places for each one of the four categories (grade groups) and also the most creative of all entries. Among the judges were the wonderful Erin LeClair from Brevard County Solid Waste Department, and eight-year-old Melissa Booth, from Manatee Elementary Environmental Club. Winner entries will be at display at the 3rd Annual Recycle Brevard Festival on Saturday, November 16, 2013 at POW/MIA Park (on US1, just north of Pineda Cswy) from 10am to 2pm. At the festival, the public will have a chance to vote for one of the entries and select one of them to receive the Best of Show prize. So come out, see the winning pieces, and vote! We would like to thank Taylored Photography for sponsoring our 3rd Annual Recycle Brevard Festival. For more information about our sponsorship program, you may download our sponsorship packet or contact us at info@RecycleBrevard.org. We would like to thank Live Clue, Inc. for sponsoring our 3rd Annual Recycle Brevard Festival. Support to Recycle Brevard Festival is in the Air! Yesterday, WFIT kindly opened up the door of its studio to Recycle Brevard for a short interview about our 3rd Annual Recycle Brevard Festival coming up next week on Saturday, November 16, 2013 from 10am to 2pm at POW/MIA Park on US1, north of Pineda Cswy. The interview will air on November 11, 2013 at 7:35am and 5:45pm. Stay tuned! 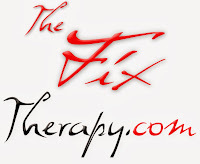 Thank you for your support, WFIT! We really appreciate the invitation and the opportunity. We would like to thank LifeStyle Homes for sponsoring our 3rd Annual Recycle Brevard Festival. LifeStyle Homes embraced solar power because, from every angle, it’s the right thing to do. We would like to thank Lighting Science for sponsoring our 3rd Annual Recycle Brevard Festival. Lighting Science, located in Satellite Beach, FL, produces high-efficiency LED lighting products and was founded in 2005, as Florida Today reported. 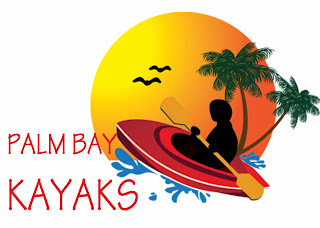 We would like to thank Palm Bay Kayaks for sponsoring our 3rd Annual Recycle Brevard Festival. We really appreciate your support! 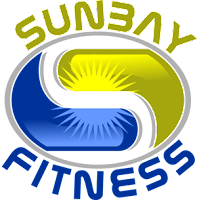 We would like to thank Sunbay Fitness and The Fix Therapy for sponsoring our 3rd Annual Recycle Brevard Festival. We really appreciate your support! We would like to thank Bob Steele Chevrolet from Cocoa, FL for sponsoring our event, 3rd Annual Recycle Brevard Festival. We really appreciate your support! November 16 will be the day to celebrate and learn a lot about sustainability, recycling, and our environment. While we are organizing our 3rd Annual Recycle Brevard Festival that will happen from 10am to 2pm, Brevard County Parks and Recreation - Central Area is busy organizing their EcoLiving Jubilee that will be from 3pm to 7pm. Both events will be on the same day, offering Brevard residents a whole day of educational and fun activities to enjoy with the whole family. All exhibitors will bring loads of information to share getting you inspired to apply some (or all!) into your life and to spread what you learn around in our community. Each event will have unique exhibitors and activities. While at the jubilee there are going to be locally sourced food trucks, at our festival, children will have a chance to participate in a toy swap and "recycle" their gently used toys. Make sure you do not miss this opportunity. It is going to be an incredible day and we are just a month away! Mark your calendars and come celebrate with us on November 16! For more information, you may contact us at info@RecycleBrevard.org. If you know how to create new things out of reusable or recyclable materials and are between Kindergarten and 12th Grade, this is an opportunity to show what you've got! Keep Brevard Beautiful in partnership with Recycle Brevard and The Reusable Resources Adventure Center is organizing a contest that is all about reusing and recycling: the Creative Recycling Contest. The contest will accept submissions of holiday decorations, useful items, posters, and artworks. To participate you just need to fill out and submit your registration form by November 8, get your piece ready, and bring it to our drop off location at the Viera Discovery Center on November 14 or 15. The pieces will be judged and first, second, and third places will be on display at our event, the 3rd Annual Recycle Brevard Festival on November 16. Prizes, certificates, and ribbons will be awarded to all winners. So don't delay! Start planning your project and participate! 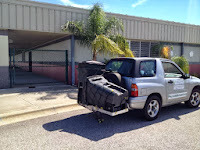 A BIG THANK YOU to our community members for donating their trash cans and recycle bins. 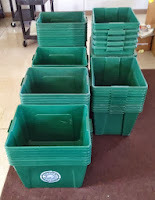 So far we have collected a total of 213 recycle bins and 51 trash cans. If you still have recycle bins or trash cans that you no longer need, you may drop them off at The Green Marketplace or in the lobby of Manatee Elementary School or contact us at info@RecycleBrevard.org to make arrangements. 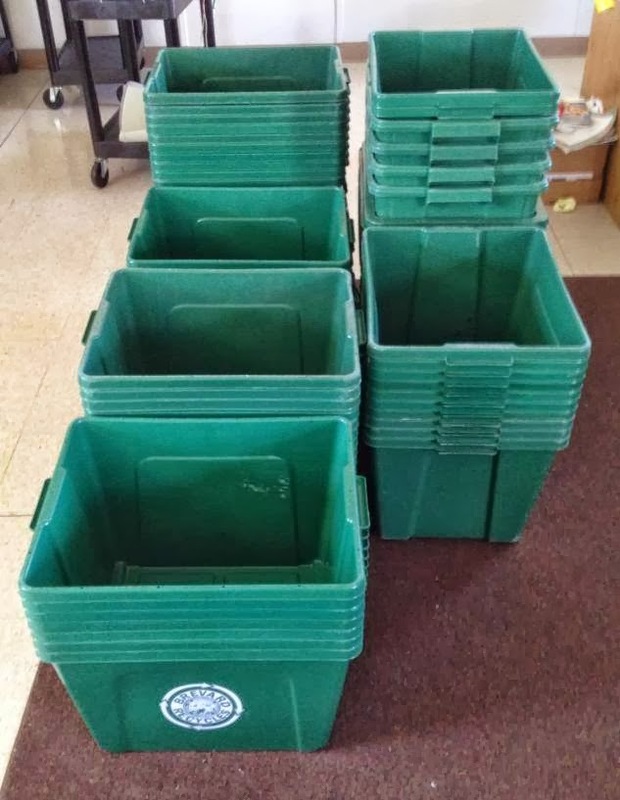 We have delivered 16 trash cans and over 50 recycle bins to Manatee Elementary, four trash cans and 10 recycle bins to The Green Marketplace, and we still have more deliveries to make. All collected recycle bins and trash cans will be put to good use. All unincorporated Brevard areas will be receiving their new recycle bins and trash cans by September 27, 2013 and the new carts can start being used on September 30th. We know that, but what to do with the old bins? The old bins are for residents to keep. If they do not want to keep the bins, according to the county's FAQ, residents may contact Waste Management to have the old bins picked up. 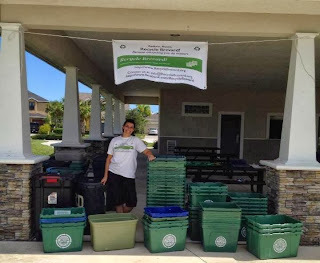 Another alternative is to donate their bins to Recycle Brevard during a collection event that is scheduled for Sunday, September 29th from 10am to 2pm at the Eastwind Park in Viera or by droping them off at The Green Marketplace starting on September 20th as the Facebook post on The Green Marketplace Facebook page instructs. My daughter got a bow & arrow during our last summer trip. 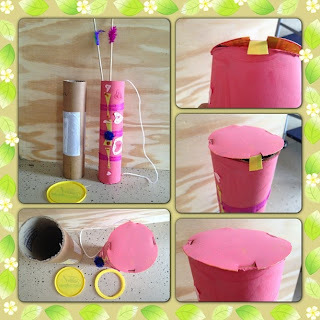 She wanted to get a holder for her arrows as well, but I convinced her we could make a better one at home using a paper tube that we had in the garage. And that is how this project started. Then we needed to get the paper tube to be the correct size. I asked my husband to cut the tube in half and that took care of the size -- it was long enough to hold the arrows for her. My daughter was very happy with the result and I was very proud of our successful project! There are so many cool things you can make with paper tubes. 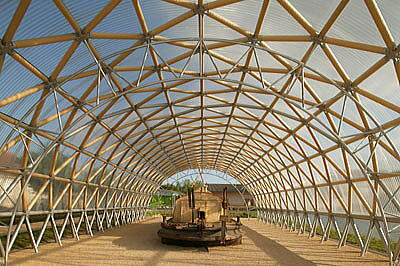 Check out this video about different wonderful projects, including modern buildings and temporary housing, that architect Shigeru Ban created and documented since he started to experiment with ecologically-sound building materials, such as cardboard tubes and paper, in 1986. Very nice! 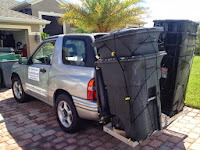 According to Brevard County Solid Waste Management Department, all unincorporated Brevard areas will be receiving their new recycle bins and trash cans by September 27, 2013. The transition plan is under way. Carts will be delivered by a delivery crew that "will use box trucks and trailers for delivery to individual addresses," as stated on the Solid Waste Department's website. The guys pulling a long trailer full of the new carts already delivered ours! If you would like to check on their progress, a delivery report is available on the county's website. Standard carts will be 64 gallon. You can check the new cart dimensions to see if you would like to change from the standard one automatically delivered to one of the two other options. According to the FAQ document posted by the Solid Waste Department, "within the first 60 days from the start of service there is no charge to switch out your standard issue cart(s). However, after that there is a $25.00 delivery charge per cart. You may also contact the Brevard County Solid Waste Department 321-633-2042"
So if you think you will need a different size, don't delay and call one of the numbers above. For residents who already received the new carts, remember that the new carts can only be used starting September 30th. If you put them out before that day, your carts may not get emptied. Also keep in mind that some of the areas may have a change on collection days. Ours went from Tuesdays/Fridays to Mondays/Thursdays for garbage and Wednesdays to Tuesdays for recycling. Check the stickers attached to your carts to make sure you do not miss your collection. No littering, please... I need to exercise. I have been feeling the need to go back to exercising for a while, but with all my activities, that was never a priority. This summer I decided it was time to start. I picked bike-riding because I enjoy going around the neighborhood, saying "good morning" to folks, and feeling the wind on my face. It is not an extraneous exercise, gets my blood flowing, and I can do it for 30 minutes every day -- in other words, it is a good start. However, when riding around here, I see trash along the way -- some recyclables, some not. I cannot resist the urge, so I stop to pick up whatever I can fit in my bicycle basket. At that time I wished I had a boogie, a bike trailer, to fit more stuff and bring them back home to dispose of them properly. But that was the wrong wish. What I really wish is that people would not litter, that they would care for leaving our neighborhood clean and pick up after themselves. All the stopping messes up my exercise. I can only be out for 30 minutes in the early morning and part of that time I am using to pick up trash instead of riding the bike. I would like to be able to take a full ride next time. So I ask: do your share and, please, do not litter. I need to exercise! 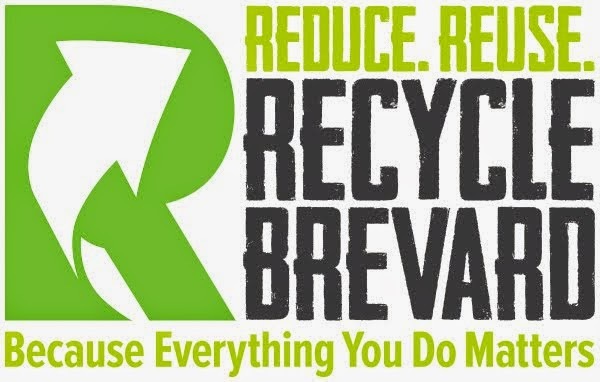 In order to keep up with all the online resources available to spread the word about the 3Rs -- Reduce, Reuse, and Recycle --, Recycle Brevard is now on YouTube, Pinterest, and Instagram. We are just starting and have a few resources available there, but we plan to increase our libraries and have loads more of educational, informative, fun, and family-oriented projects available through those channels. Check them out! It all started as an initiative to get more information out so more residents would embrace the 3Rs (reduce, reuse, and recycle) and help our community raise our recycling rates. We have come a long way since then, organizing projects, participating in events, bringing the recycling idea to clean ups, and much more. But, above all, receiving a growing support from our wonderful volunteers, from other organizations in the county, and from our community has been the most important thing in this journey. Without them, nothing would have been possible. Now, in its second anniversary, Recycle Brevard is taking another step further and becoming an entity, a not-for-profit organization. We hope this way we can reach even more residents and businesses, get them all engaged in promoting and living by the 3Rs ideal, and be able to organize bigger projects and events. A lot of good stuff in store this year and we are looking forward to all that this new phase has to bring. New Year, New Projects, New People! Every year we get a chance for a new start. We have resolutions and create plans for the new year. And this is what we will be doing too. This January we will be putting our heads together to decide on projects to concentrate on this year. Some things we do, like America Recycles Day and Festival of Trees, we do every year and intend to continue doing them. Other projects are done regularly, like beach clean-ups and the distribution/donation of reusable items, but which other projects should we elect to be the chief this year? It is a difficult task... There are so many interesting things we can do, others that need doing, and many more that we could improve. All of them need to be considered while taking into account time, resources, and help available. In order to select the type of project and the project itself, we need to know that we will be able to do it. That is where you come in: we need your help. From suggestions on projects to do to participating in them, to participating in Recycle Brevard more generally, we need your help.The more people involved, the more we can achieve. Last year we got more volunteers on board: our America Recycles Day had Terry Mott to help organize it all, other friends helped on the day of the event and assisted preparing some things for it, our Facebook page now has Diana Elting helping out with content, and this blog has Diana Elting and Meagan McGone as authors who will soon be making posts to share interesting information and insights with our followers. I cannot thank them enough because every little bit of time they can use to help represents a great contribution and is very much appreciated! So our first resolution for this year is to engage even more people, get them involved in projects and other things we do. The new year is here. Now we need new projects and new people. While we are putting ideas together for possible projects, would you think about the possibility of lending a hand?